These are the ribbons I got from Tinsel Trading Co. I fell in love with so many, but tried to limit my choices to things I knew I would really use regularly. Below is a detail shot- love the little elephants!! Next up, Gemstone strands! 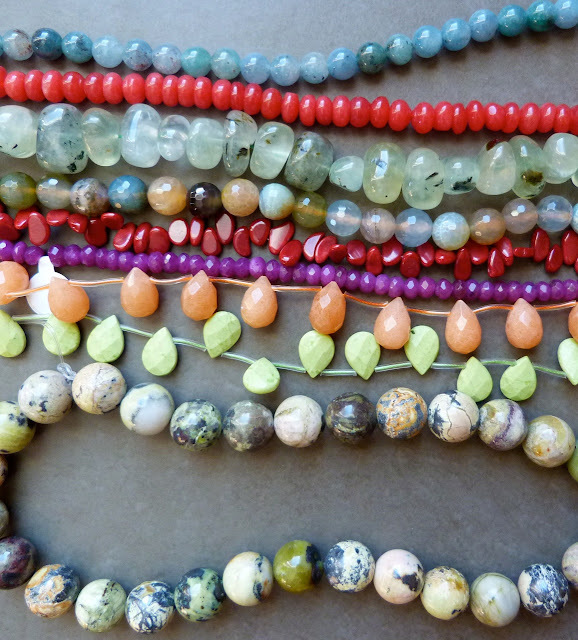 I picked medium sized stones- apatite, strawberry quartz, prehnite, mixed agate, coral, Ruby quartz, aventurine, lemon chrysoprase, and some large yellow turquoise rounds. 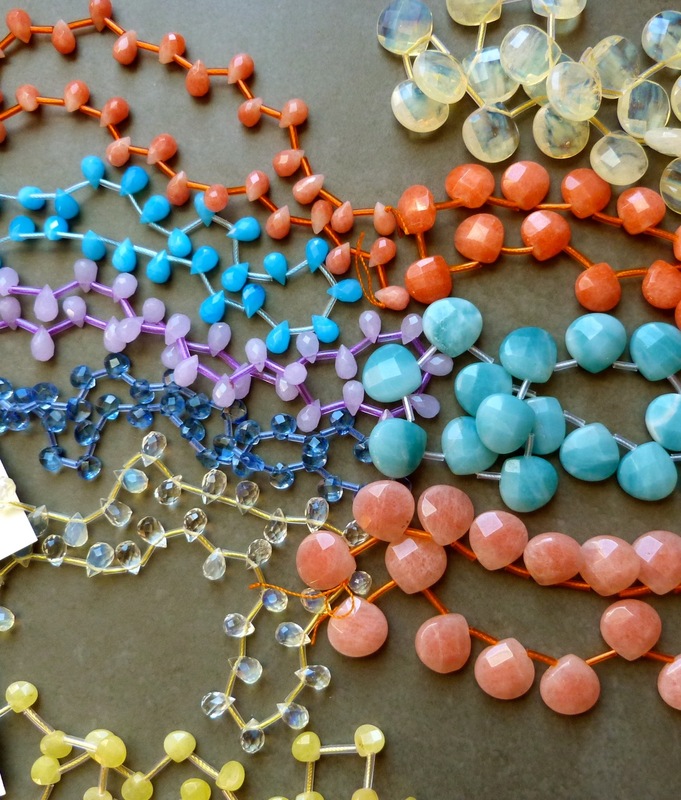 Clearly I was on some sort of Spring holiday in my mind- and went a little crazy with various stone briolettes in Coral, Pink, Teal, lavender, yellow and blue. The best deal ever, large bags of faceted glass beads in various colors! Got these at City Beads- awesome shop! 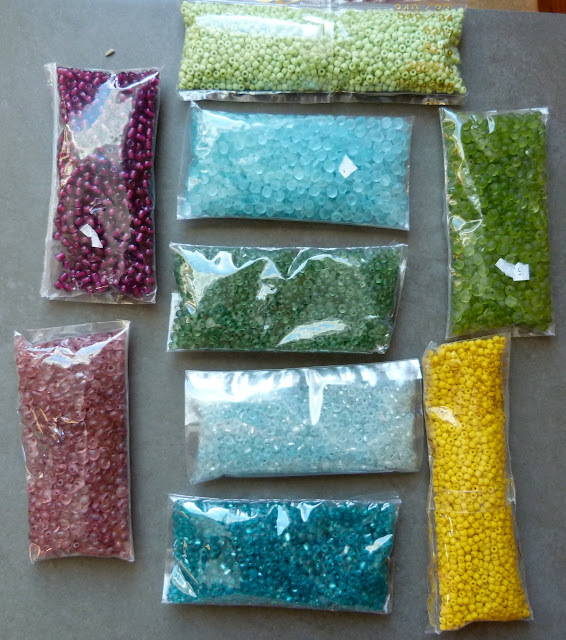 Stocked up on some seed beads, different shapes and sizes- gold, greens, reds, and teal colors. OH OH OH! the chain! Absolutely love it. I got a couple of yards of each- Hoping I don't go through it too fast. 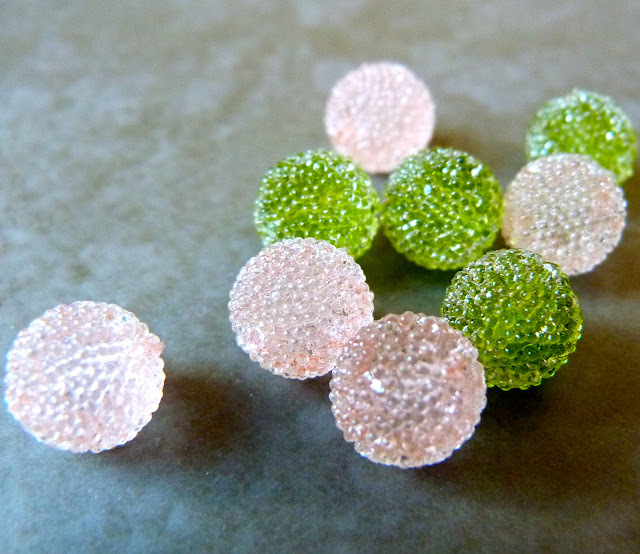 Sugary sugary lucite rounds- don't they look like candies! Good enough to eat. Some vintage goodies from Tinsel Trading, dyed buttons, vintage glass cabs, and brass findings. Looking forward to going back! Now I know where to head next time for the best deals! Labels: art beads beading shopping city beads NYC gemstones nyc NYC loot ribbons strands Tinsel Trading Co.
Lorelei, you must have had a great time shopping! You have a great haul! 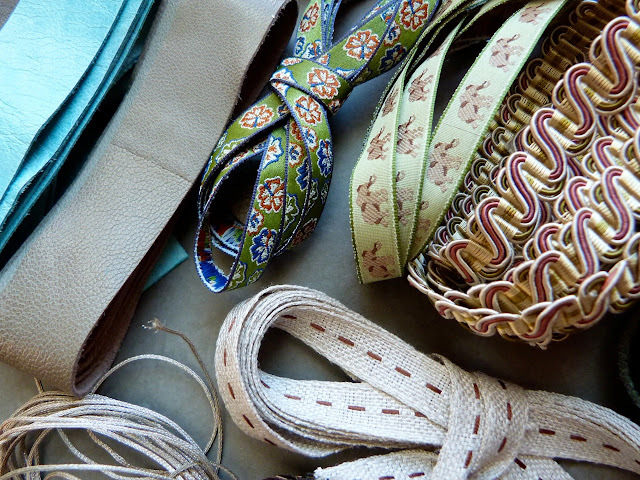 Amazing materials. I especially like the lucite balls and the felt strand that looks like leaves. Shopping envy. You lucky chick! Don't know what to say Lorelei ... wow wow wow ... what a successful trip that was for you. Esp love the chain on the left! Thanks for sharing :) I'm loving the ribbon, the elephants are super sweet! It looks like you ladies had a well deserved awesome trip! My mouth is watering over all those beautiful selections. Can't wait to see what you create with it all. So many fun new goodies! Yay! Wow, great finds! Looking forward to my trip to NYC in March! I cannot believe you went shopping in Manhattan on one of the coldest days we've had so far this year! Looks like it was worth it and you had a great time and made a major haul! 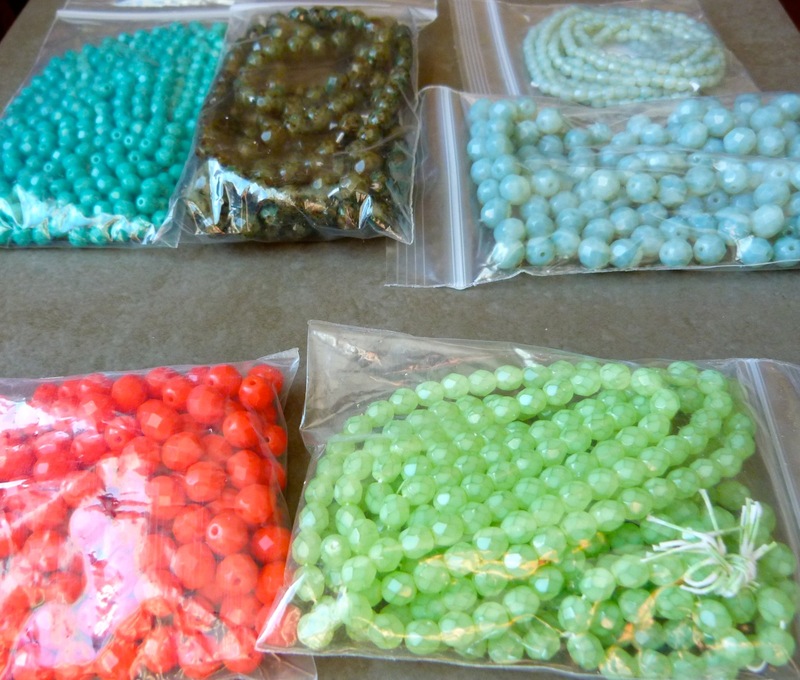 BTW,...where did you get those strands of Czech glass beads? OH! SWOON! Such wondrous goodies! YUMMY -- this post leaves me so bead hungry ... Was in NYC with my mom and sister for a long theatre weekend last January and almost froze to death, but this makes me want to go back ... like NOW! 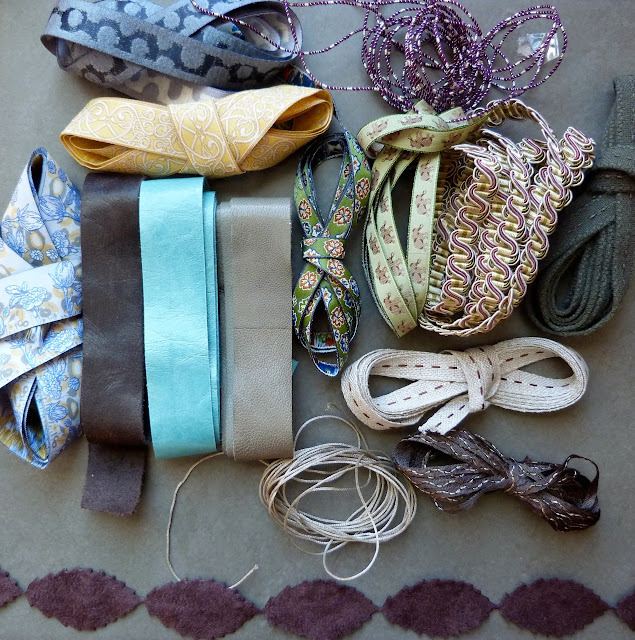 I LOVE the chain, can't wait to see what you make with all this stuff! 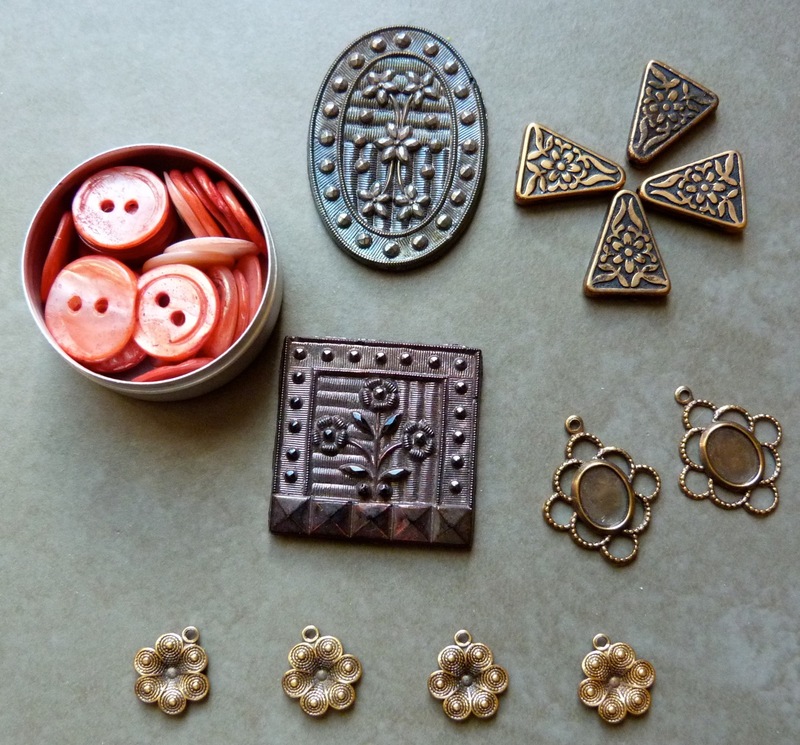 Lorelei - Lovely goodies, your bead muse will go wild creating with you!! Sounds like you had a great weekend as well! Happy beading! Oh, yum! I must admit to being slightly jealous! I can't wait to see what you do with those ribbons! I'm interested to see what you do with the unique chain. I've never seen anything like it! droooool. do you know i've never been to NYC? and now, i'm getting to the point that i'm almost afraid of going because i don't know if my brain could handle the sensory overload! especially TTC. i think i might pass out from joy! Oooh, I totally have bead/ribbon/chain envy!!! You are one lucky lady! :D Can't wait to see some of your creations. Glad to hear you ladies had a great time and finds in the Big Apple.Fortunately for me I live here so I get to jump into all the little funky bead shops. Next Apple visit drop into Metalifferous on West 46th St. Great beads and metal products, books & tools. FIT & the 92nd St. Y metal teachers recommend this place. Also, Bruce Frank on West 83rd St. Very small shop with one of a kind stuff. A little on the high end. What a great stash!! I am LOVING that chain! 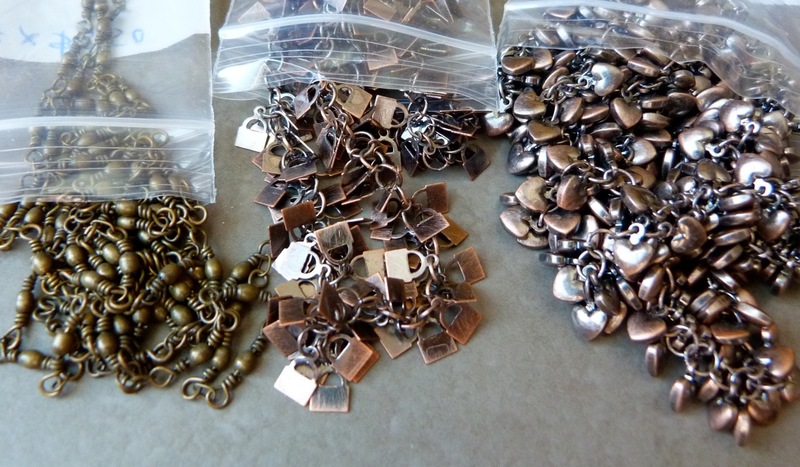 We normally have a bead show in Calgary every year and they canceled this year!! So much for getting some shopping done! I guess I will have to take care of that in California in Sept! !